Have you ever invited friends for dinner only to find you didn’t have enough chairs to seat them around your table? Even worse, have you ever hosted a dinner party only to have no chairs at all? High-quality dining room chairs are essential! No matter how well you dress up a milk crate, it’s just not going to be the same. Before you rush out, wallet in hand to purchase the first inexpensive dining chairs you come across there are a few things for you to take into account. Height: Most dining tables are designed to be 30 inches high. You may find the most unique dining room chairs on the planet, but if they’re not able to slide easily under the table, they will be useless. Look for chairs that are approximately 18 inches from floor to seat. This is the magic number that gives enough lap and leg room for each of your guests. Width: The last thing you want is for your friends to have their elbows in each other’s soup. Comfortable dining chairs are always between 16 – 20 inches wide. Adding an extra six inches per chair ensures that your guests will not be crowded when they are seated. There are as many different unique dining/kitchen chairs as there are decorating schemes. Your choice is dependent on the look you wish to achieve. Upholstered models make for excellent dining room accent chairs for those looking for a less traditional look. When you place two at the head of the table and then use the non-upholstered variety on either side, you not only create a dramatic feel to an otherwise uniform set. Just be sure to use no more than two different finishes to prevent overkill. Finding Exclusive Dining Chairs at Everyday Prices! Whether you need minimalist dining chairs to go with your statement table or something carved and traditional, 1StopBedrooms has you covered. 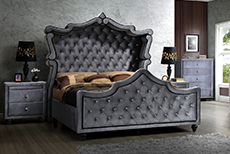 We have over a decade of experience delivering the world’s best furniture at the nation’s best prices. With steep discounts, daily coupons and award-winning customer service, we make seating your guests as smooth as a mouse click. Don’t be caught hauling your lawn chairs in next family reunion, take advantage of our fantastic deals today.